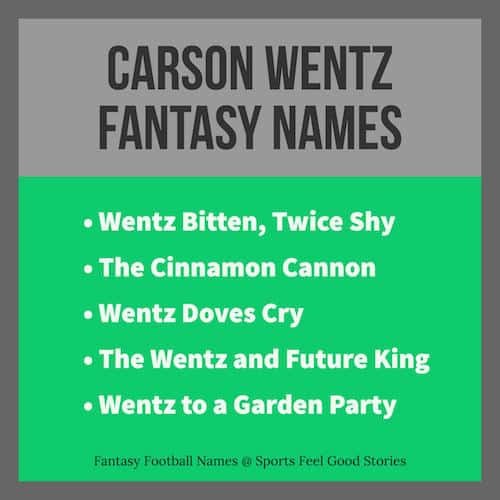 You’re on Carson Wentz Fantasy Football Names – page 14 of 30 pages of fantasy football team names and league names. See complete menu below. Our suggestions for Carson Wentz Fantasy Football Names will give you some food for thought if you were able to draft the Eagles’ quarterback. Playing college ball for North Dakota State University, Wentz came into the NFL and surprised many people by making some significant contributions to the team immediately. He had the tools and the poise to move quickly from the college game to the pros. The general consensus is that he is a rising quarterback with a high ceiling. Now, take a look at our cool fantasy names for Carson Wentz. Wentz, Twice… Three Times a Lady. Carson Wentz threw for a league record 379 completions by a rookie. He broke the record of 354 completions held by former Eagle Sam Bradford. Carson threw for 278 passing yards and 2 touchdowns in his debut game against the Cleveland Browns. Carson was the valedictorian for his high school class. As a freshman, he stood just 5′ 8″ but grew to 6′ 5″ by his senior year. Wentz to a Garden Party. You Wentz Some You Lose Some. The Wentz and Future King. Carson was drafted by the Eagles in the first round as the second overall selection. The last Eagles QB to be drafted in the first round was none other than Donovan McNabb. If you have any suggestions for cool and funny Carson Wentz fantasy team names, please let us know via our Contact page. Thanks!